Jill and I were finally able to use the rainchecks from the 2007 Mets season when we went to this 'businesspersons special' game at Shea. 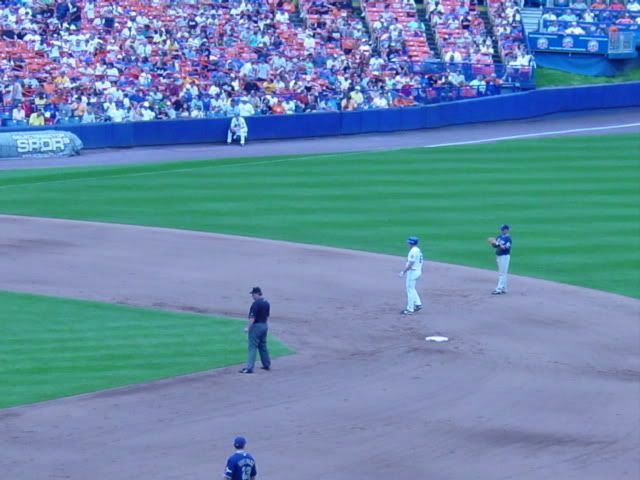 The previous season, we had purchased tickets and train tickets to try a theory of driving to Brewster and then taking mass transit to the Mets game. When a spring snow storm blew through the tri-state area though, that put the kibosh on our plans and it took us over a year to find a game to use our tickets at. We actually left the night before, and drove as far as Mount Olive, New Jersey. The gametime was 12:05, so being closer to New York and Shea worked out pretty well as we didn't have to leave really early from Binghamton. We stayed at the Best Western Mount Olive (AAA rate was $89.99 a night) on Route 46 in Budd Lake, New Jersey. The Mets were home against the Padres, and although the bullpen tried to lose the game once again for the home team, Jill's favorite guy David Wright hit a walk off homerun in the bottom of the ninth to send everyone home happy! We had a decent view of the hit from our first base side loge seats. After the game, since it was still 'early' for us, we drove 'upstate' to the Palisades Center in West Nyack. Wandered around there for a while and had dinner at Buffalo Wild Wings before heading back to Binghamton. NEW YORK -- Sometime Wednesday, Mets pitching coach Dan Warthen chatted with Trevor Hoffman, the man with the most saves on the planet. Their conversation touched on the status of the Mets' bullpen in the absence of Billy Wagner, who has the sixth-most saves in history, and on several bullpen comrades who haven't distinguished themselves during the first days of his convalescence. Hoffman felt that Wagner's absence came with a silver lining, one scarcely visible in the Mets' 5-3 victory over the Padres on Thursday. "Sometimes, the best thing that can happen to a bullpen is to lose the closer," Hoffman told Warthen. "It makes the other guys step up." The alternate take is this: Sometimes the best thing to happen to a bullpen is for David Wright to hit a walk-off two-run home run to camouflage relievers' missteps and change a potentially nasty defeat into a most uplifting victory. Wright spared the Mets a loss, their bullpen more angst and the Padres an extra-inning game on getaway day with the first final-pitch home run of his life -- amateur, scholastic or professional, but not backyard. Through seven innings, the Mets led this one, 3-1, because rookies Nick Evans and Daniel Murphy had driven in three runs combined and because Johan Santana was pitching quite effectively. But a run in the eighth, charged to Santana and allowed by Pedro Feliciano, put Shea Stadium in full squirm mode. And the home run Jody Gerut hit against Scott Schoeneweis in the ninth marked the sixth time this year that the bullpen was unable to protect a lead for Santana. "This is reality, and the reality is that I only have nine [victories]," Santana said. "I don't blame anybody. I don't feel sorry about things that couldn't happen or didn't happen. That's just the way it is." Santana, accompanied by his 9-7 record, watched the Gerut and Wright home runs on a clubhouse monitor. "There's going to be times when things are not going to go the way people want," he said. "But we won the game and we won the series. That's all that matters to me." Indeed, the third-place Mets won the rubber game of a series for the 13th time in 17 series to move within two games of the first-place Phillies and one-half game of the Marlins, for second in the National League East. "It's amazing ... the effort he goes out and gives, and to not be rewarded," Wright said of Santana. "As a teammate, that hurts to watch. "It's been just once, maybe twice we've given him [enough runs] where he can coast. We've just got to continue to add on offensively. We had opportunities to add on during the course of that game. So I don't think this one's on the bullpen. This one's more on the offense. We've got to go out there and drive in some runs." The Mets won -- for just the second time in seven games against the last-place Padres -- because Wright sensed losing pitcher Heath Bell, the former Mets reliever, would throw a slider with a 1-0 count; because Santana had been effective for seven innings, allowing two hits and three walks and striking out seven; and because Evans is taller than the average bear. The strongest image of the Mets' second victory in seven games -- other than Wright's victory lap around the bases -- was that of Evans stretched out on the infield cutout at first base, his left arm fully extended and the baseball in his glove. "I used most of what I have to reach it," the 6-foot-2 Evans said. A first baseman in the Minor Leagues but an outfielder in his two tours of big league duty, the rookie started at first to afford Carlos Delgado a day of rest. And he was there when the Mets executed an impressive 4-6-3 double play to end the eighth inning. Santana, who had pitched into the eighth for the third time in four starts, had allowed two hits and three walks through seven innings. But Luis Rodriguez and pinch-hitter Edgar Gonzalez produced softly-struck singles that prompted manager Jerry Manuel to summon Duaner Sanchez from the bullpen. Sanchez's lone pitch struck Scott Hairston, loading the bases. Pedro Feliciano produced one out when pinch-hitter Brian Giles forced Rodriquez at the plate. 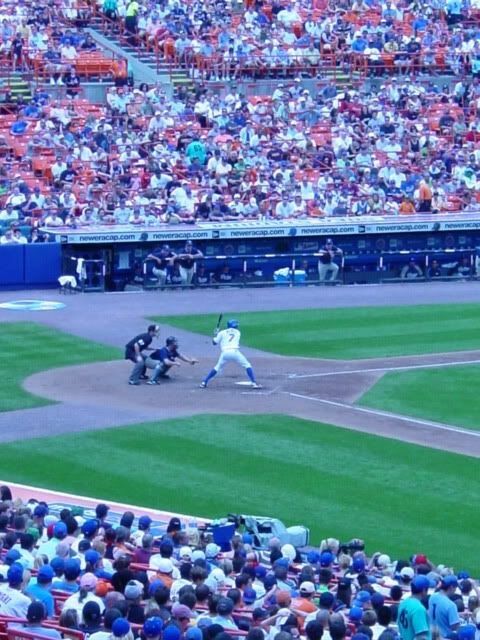 But Adrian Gonzalez singled past shortstop Jose Reyes to drive in Hairston. Joe Smith replaced Feliciano and elicited a ground ball from Kevin Kouzmanoff that had base-hit aspirations. Second baseman Argenis Reyes dove to his right to make the stop and flipped to Jose Reyes, who made a rushed throw to first that all but pulled Evans from the base. Evans saved the victory before Schoeneweis squandered the save. "[That was] the catch of the day," Aaron Heilman said. No one could catch the ball Gerut hit well over the wall in right-center field for his third home run of the series and the third home run allowed by the Mets' bullpen in the three games. "I am fully confident that if I am given the ball in those situations when Billy's out, that I can get the job done," Schoeneweis said. "But I'm not a closer, and that's reality. Neither is anyone else in here. We have one closer, and he's hurt. ... As a bullpen, we've struggled, but we're the same guys that threw up 23 scoreless innings, what, 10 days ago?" Effective relief often goes unnoticed. It's why Schoeneweis -- who wears No. 60 -- likens relievers to offensive linemen, unrecognized until the quarterback goes down. Wright's third hit and 21st home run -- the team's second walk-off shot this season -- was a salve for the sting that Schoeneweis and the others relievers experienced Thursday. "We all feel it," said Heilman, who surrendered a three-run ninth-inning home run to Gerut that imperiled the Mets' victory on Tuesday night. And they all felt unburdened when Wright righted the wrong. Heilman replaced Schoeneweis after Gerut's homer Thursday, retired two batters and emerged as the winning pitcher. "Maybe that will help Aaron get started," Warthen said. An adjustment in Heilman's delivery, suggested by Warthen -- less hip thrust, so his pitches aren't so flat -- will make the difference. "Improvement has to start somewhere," Manuel said. "Lately, we've just had a real problem of keeping the ball in the park, no matter who it is out there. We seem to give up a lot of home runs. ... It's a good thing we're going to eventually figure it out." a-Singled for Meredith in the 8th. b-Grounded into a forceout for Iguchi in the 8th. HR: Headley (8, 2nd inning off Santana, 0 on, 1 out), Gerut (10, 9th inning off Schoeneweis, 0 on, 1 out). TB: Hairston 2; Gonzalez, A; Headley 4; Gerut 4; Rodriguez; Gonzalez, Ed. RBI: Headley (17), Gonzalez, A (85), Gerut (29). Runners left in scoring position, 2 out: Gerut. SB: Headley (1, 2nd base off Santana/Castro). 2B: Beltran (26, Banks), Wright (29, Banks). 3B: Reyes, J (13, Banks). HR: Wright (21, 9th inning off Bell, 1 on, 2 out). 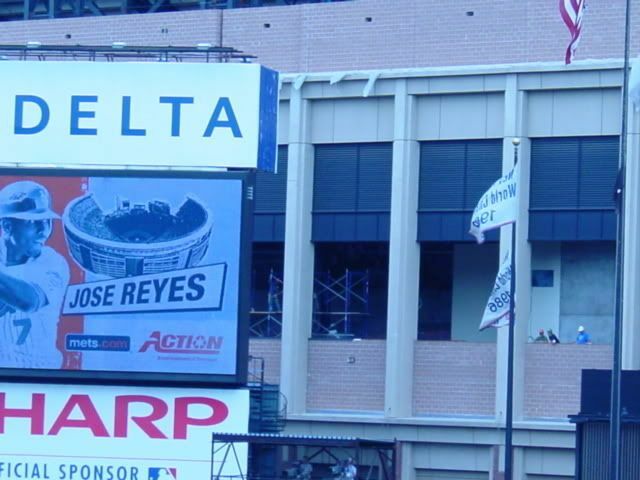 TB: Reyes, J 3; Wright 7; Beltran 4; Murphy 2; Cancel, R; Evans; Chavez. RBI: Murphy (3), Evans 2 (5), Wright 2 (87). Runners left in scoring position, 2 out: Tatis 3; Wright; Reyes, J.
SB: Beltran (17, 2nd base off Meredith/Hundley). DP: 2 (Reyes, A-Evans, Reyes, A-Reyes, J-Evans). Banks pitched to 2 batters in the 6th. Santana pitched to 2 batters in the 8th. Sanchez pitched to 1 batter in the 8th. Pitches-strikes: Banks 89-59, Meredith 23-15, Corey 15-10, Bell 11-7, Santana 104-68, Sanchez 1-0, Feliciano 6-5, Smith 4-3, Schoeneweis 4-3, Heilman 6-5. Ground outs-fly outs: Banks 7-4, Meredith 4-1, Corey 1-1, Bell 0-2, Santana 6-8, Sanchez 0-0, Feliciano 1-0, Smith 2-0, Schoeneweis 0-1, Heilman 1-0. Batters faced: Banks 25, Meredith 7, Corey 3, Bell 4, Santana 27, Sanchez 1, Feliciano 2, Smith 1, Schoeneweis 2, Heilman 2. Inherited runners-scored: Meredith 2-1, Sanchez 2-0, Feliciano 3-1, Smith 3-0. EjectionsSan Diego Padres Bench Coach Craig Colbert ejected by HP umpire Todd Tichenor. (8th); San Diego Padres Manager Bud Black ejected by HP umpire Todd Tichenor. (8th). Umpires: HP: Todd Tichenor. 1B: Brian Gorman. 2B: Gerry Davis. 3B: Bruce Dreckman.